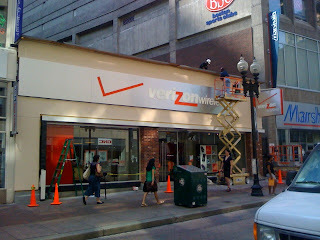 I was walking to work today and passed by the storefront for the new Verizon in Downtown Crossing. They finally took off all the boards that were covering it up - so I'm guessing that it should be opening soon. The gentrification of Downtown Crossing is now in full swing. 1 Response to "Verizon Store Coming to Downtown Crossing"
As of lunchtime, it's open. I walked by around 1:30 and it had customers and employees inside.